UQ School of Biomedical Sciences PhD student Katherine Burgess said the giant manta ray was one of the marine world's iconic animals, but little was known about its feeding habits. "The previous knowledge of giant manta ray diet was based on observations of feeding activity on surface water zooplankton at well-known aggregation sites," Ms Burgess said. "Giant mantas are found in tropical and temperate waters worldwide. They can grow up to seven metres across, weighing up to 1350kg, although their average size is four to five metres. Ms Burgess said the study began in 2010 and focused on Isla de la Plata, off the Ecuador mainland, that seasonally hosted the world's largest aggregation of giant manta rays. 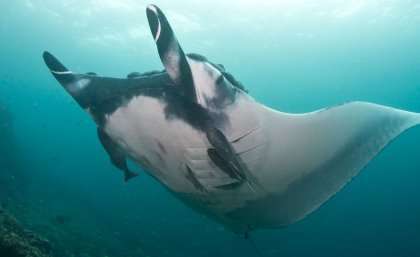 The giant manta ray is listed as vulnerable on the International Union for Conservation of Nature's Red List of Endangered Species because its population has decreased drastically over the past 20 years due to overfishing. Ms Burgess said researchers normally looked at stomach contents to determine an animal's diet, but such a potentially distressing or lethal procedure was not appropriate with a vulnerable species. "We studied the giant manta rays' diet using biochemical tests, such as stable isotope analysis, which works on the 'you are what you eat' paradigm," she said. "These tests can determine what animals have been eating by examining a piece of tissue from a muscle biopsy from a free-swimming animal." Ms Burgess said the study suggested the majority of the giant manta rays' diet was from deep sources rather than surface zooplankton. Professor Anthony Richardson, a scientist with UQ's School of Mathematics and Physics and CSIRO's Oceans and Atmosphere division, said the research found an average 27 per cent of the giant manta rays' diets came from surface zooplankton and 73 per cent was from "mesopelagic" sources including fish from 200m to 1000m below the ocean surface. "The deep ocean is the next frontier for open ocean fisheries, and we are only just realising the potential reliance on this zone by threatened marine megafauna," Professor Richardson said.